How to Make Condom Roses! So this is instructions on how to make condom roses! They're fun gifts to give to friends for valentines day or to your significant other! They're very simple to make. All you'll need are some green pipe cleaners, some condoms with fun colored wrappers and green duct tape. Really any condoms with square-ish wrappers will work. The plastic wrappers bend easier than the foil ones, but as you can see, the foil ones work too. If you're looking for red ones, both Durex and Lifestyles have red condoms that you can use. I would also suggest pink. For my bouquet I used Durex Love (red), Trojan Elexa (black and purple), Crown (silver) and Lifestyles Skyn (Gold). Disclaimer - Because the condoms during this project get bent, its up to your own discretion on whether or not they are still usable. Bending the condoms may weaken them, making them more likely to break. It's really your call. To make the stem, twist the 3 green pipe cleaners tightly together. The first petals are the innermost petals. Bend the first condom in half on a diagonal so it forms a triangle. 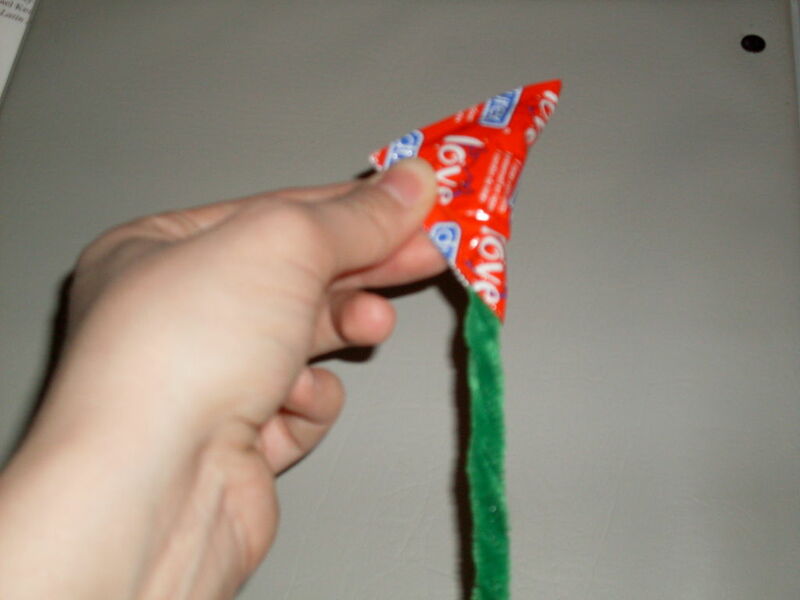 Fold it this way with the pipe cleaner stem in the center of the condom so that the pipecleaners are at least half way into the condom triangle (since you'll need the pipe cleaners to support the weight of the rose). Step 4: Tape It On! Rip off a piece of green duct tape and wrap it around the bottom of the condom, holding the condom to the pipe cleaner stem. Fold the second condom in half on a diagonal and put it on the opposite side of the first condom, so that the point of the triangle on the first condom is inside the center of the second condom. Rip off another strip of duct tape and wrap it around the condom and the stem again. Squeeze the two petals towards each other a bit to make them more 3D, it makes the rose look more realistic and preps for the outside petals. Bend the 3rd condom in half like the other two, and then unbend it. Place the condom on a diagonal on top of the other two petals. Rip off another strip of duct tape and tape the third petal in place, wrapping it around the other two petals as you tape it. Repeat step 8, rotating the rose so that the fourth petal is place next to the third one, overlapping it a bit. Tape it there with green duct tape, wrapping it around the third petal and the inner two petals. Repeat step 8 again, rotating the rose so that the last condom is placed next to the fourth petal. It should overlap both petals 3 and 4. Conform it to the shape of the rose and tape it there. Your condom rose is finished! You can give them to your friends, or make a bouquet for your significant other. The possibilities are endless! Very clever and creative. This would also be cool to make for a bridal shower. This is a fantastic idea for the more intimate couples. A suggestion is that for some twisted reason, if you may have kept the condom wrappers, they may be used for the petals...? I'm thinking that you can still get the idea across while not "wasting" the condom if you decide that you don't want to use them. It's a thoughtful gift, and a strong suggestion!